I got in touch with Balinese dancer and teacher Ni Madé Pujawati who is a member of S.E.A. Arts who lives and works here in London. Over a coffee in a cafe in Hampstead Heath I told her about my project and how passionate I was about it, hoping to infect her with the same passion. Job done. As she wasn’t that busy with teaching this year, she was able to help! Joy. Puja also told me of a brilliant musician called Nye Parry who works in both gamelan and Western music composition, which really got me excited. My mind flew to where the character of Dollah could be, trapped in feeling that his culture was too restrictive but unable to feel part of the modern western world, expressed musically and not just in dance form. 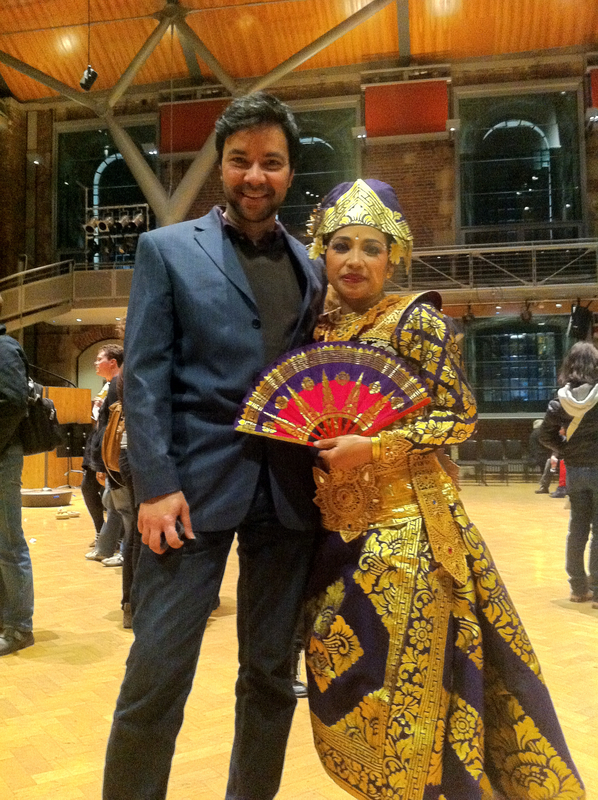 We agreed on a date for my first lesson after her performance with Gamelan Lila Cita at the LSO St Luke’s. The more I see and hear this music performed the more I think I need original score for Unbroken Line. Can anyone help? Here Puja and I pose after her tour de force performance of Terunajaya. Actor, Artist, Professional Voiceover. Creative person who has coined his process 'Skylarking'. This entry was posted in Theatre and tagged Acting, dance, Malaysia, physical, theatre, unb, unbroken line. Bookmark the permalink.